D-Block elements/ Transition elements: Properties and explanation of How and Why? Every year questions are being asked in nearly all the competitive examinations like NEET, JEE, UPTU, WBJE, etc. from d-block element. Get the complete notes on the d block elements or transition elements and their important characteristics with why and how explanations. Every year questions are being asked in nearly all the competitive examinations like NEET, JEE, UPTU, WBJE, etc. from d-block element. D-block elements occupy the space between the s-block (most electro positive) and p-block (most electro negative) in the periodic table. Since they bridge the two blocks and show a transition in the properties from the metals to the non-metals, they are also called Transition elements. 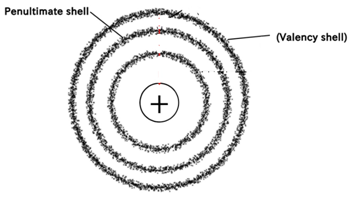 The last electron of this block elements enter into the penultimate shell (The outermost shell of an atom is called valence shell while second last shell is called penultimate shell). Any element which has incompletely filled d-orbital in its ground state or in one of the most common oxidation state. Now let’s talk about the transition series: The set / collection of transition metals is called transition series. There are 4 transition series in the transition elements that is 1st, 2nd, 3rd and 4th transition series. As we move from left to right, atomic radius decrease first because of increment of effective nuclear charges and after that it becomes constant (due to the poor shielding effect of d-electrons) and then after it starts increasing towards end because of the e-- e- repulsion which are higher as compare to the increase in the effective nuclear charge. Transition elements can form alloy because of almost same size, so one atom can take the place of other atom in the crystal lattice. Enthalpy of atomization is high in transition elements and the reason is again the presence of unpaired electrons. Eg: when we will move from left to right means from Sc to Zn, the enthalpy of atomization will increase till Mn and then decrease towards the end that is Zn. So moving from left to right, the number of unpaired electrons will increase till Mn and then decrease till Zn. Transition elements shows variable oxidation states and it is possible when they will form the intermediate during the reaction. Let’s compare the +4 oxidation state for Ni and Pt. K2Pt Cl6 - Exist, Why?? In both the compounds, Pt and Ni elements are in +4 oxidation state. As we know that the +4 oxidation state of Pt is more stable than +4 oxidation state of Ni. Concept: Lower the electrode potential; grater will be the stability of higher oxidation state of the metal in aqueous solution. Arrange the given metal ions according to their stability? In case of Fe+3/ Fe+2, the E value is lower as compare to the Mn+3/Mn+2. This means the tendency of Fe+3 to get reduced into Fe+2 is very less. Let’s have a look on the few questions based on the oxidation states. Q. Why Cu+ is unstable in aqueous solution? More negative hydration enthalpy of Cu+2 compensates for the high ionization enthalpy that is why Cu+2 is more stable. Conclusion: here we have covered all the important features of d-block elements and also discussed the few important questions. It is very important to get the clear concept about the topic of this chapter.